Who would have thought that one day we could install 4 tracks on a vehicle in 15 minutes, while keeping the tires on and without any modifications of this vehicle.The first ever wheel driven track system”, an innovation that will make it much easier to use tracks on your vehicles. The innovative Track N Go design allows you to easily slip-on the track system without any modifications to your vehicle, simply drive onto the treads, lock them in place, and you´re ready to fearlessly barrel through snow. Designed to mount on most 4 x 4 vehicles, the Track N Go system installs in less than 15 minutes while keeping the tires on and without any modifications to the vehicle. 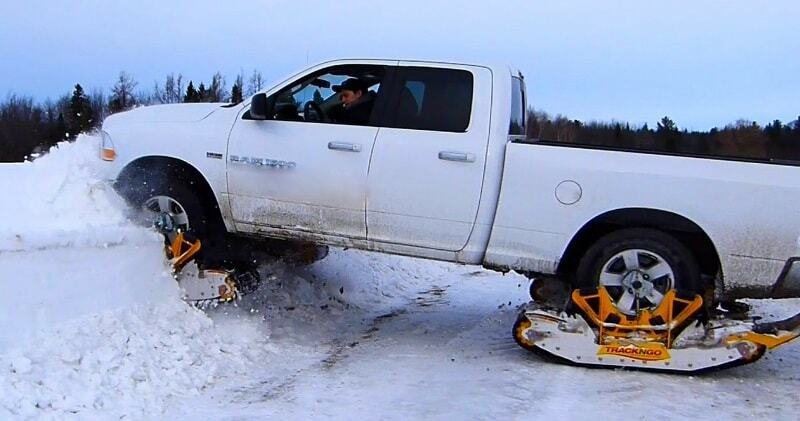 When installed, the vehicle can reach up to 60 km/h on the road and from 15 to 40 km/h on snow, depending on the thickness of the snow. The track system also comes equipped with anti-diving snow deflectors, preventing the tracks from diving in deep snow.